Climbing to the top of the Power Tower to ride The Abyss - barefoot and wearing only a wet swimsuit - can be a chilling experience. Of course, settling down and plunging into the darkness is scary, but it also gets windy up there! 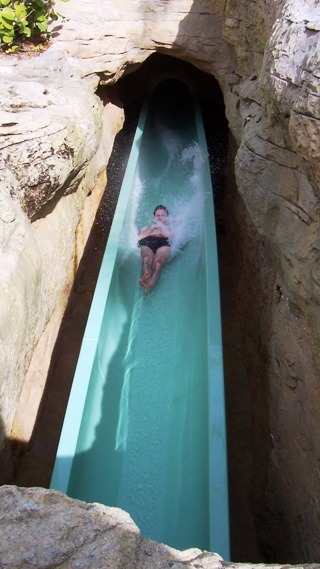 At midday, the sun keeps you warm, but if you decide to beat the crowds and go when the slides open (10:00 AM), the morning breeze may still be a bit cool. Be sure to read and follow all the rules. Once the light turns green, the attendant will let you sit down at the top of the tube. After the reminder to cross your arms and legs, you’re free to go! You push off and immediately slip into the darkness. You can close your eyes of leave them open: it’s too dark to see anything. On the other hand, you know you’re going fast. Then a flash of light as you pass through a quick open area of the tube. A rider on the Abyss flashes through the open area. In an instant, you’re plunged back into darkness. Suddenly, you shoot out of the tune and land in a pool of warm, dark water. 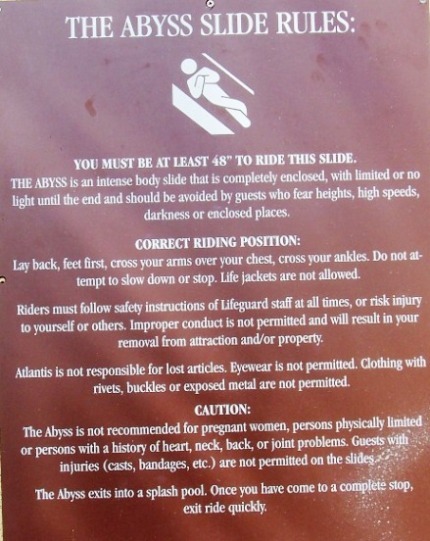 As you get to your feet, laughing, the lifeguard will point you towards the steps out of the subterranean lagoon. As you climb out of the water, you see colorful fish in aquariums in the cavern walls. Dripping wet and grinning, climb the stone steps up into the sunlight – and right up to the top of the Power Tower for another ride!